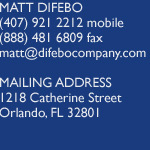 DiFebo is best known for being the architect in building the model ticket sales and customer service program in collegiate athletics at the University of Central Florida Athletic Association. Under his direction the number of new season tickets has increased by over 14,000, at its peak, and there have been significant increases in football ticket sales revenue each of his four seasons with the UCFAA. Ticket sales revenue has grown by over $4.5 million annually and his ticket sales model has produced nearly $3 million in additional donations to the UCFAA fundraising division, the Golden Knights Club. In addition to success in increasing season ticket sales, DiFebo has led efforts to incrementally increase revenue opportunities with successful group sales initiatives and partial season ticket plans for Football, Basketball and Baseball. Basketball ticket sales have also increased substantially; season ticket numbers have more than doubled and basketball revenue has increased by over 400%. DiFebo has built his expertise and experience over the years working for the University of Central Florida Athletic Association, the NBA's Seattle Sonics and WNBA's Seattle Storm as well as the Tampa Bay Rays. He also gained experience in call room operations while working for the Clinton Group, Inc. of Gainesville, Fla. where he served in various supervisory and sales roles before being promoted to Outsource Manager where his responsibilities included the management of outsourced telemarketing programs and negotiating contracts for outsourced programs. A native of Pennsylvania, DiFebo is a graduate of the University of Florida where he earned his Masters of Exercise Science in Sport Management and his Bachelors in Recreation. He serves on the Migala Report Editorial Board and has served on the Board of Managers at the Central Florida YMCA. He is also involved with Big Brothers Big Sisters of Central Florida. In his spare time, he enjoys playing golf and reading. Matt is also an avid runner and is currently training to run the Chicago Marathon in October and the New York City Marathon in November. He has completed nine full-marathons and three half-marathons since January 2005; including four full-marathons in a six week timeframe in January/February 2008. Matt worked for the UCFAA for over 4 years, beginning as the Director of Sales & Service and most recently serving as the Associate Athletic Director of External Services. During his time there, football ticket sales revenue increased to over 4.5 million annually. Matt DiFebo presented "Maximizing Ticket Sales Revenue"
Matt established a new Inside Sales Department for the teams. Shortly after graduating from the University of Florida, Matt was hired to establish an inside sales program for this MLB franchise. 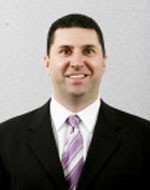 While obtaining his Master's degree, Matt worked in the UFAA in the Sports Information department and the Ticket Office. Matt's intimate knowledge of the call room industry starts with 4 years at the Clinton Group, first as a sales representative, working his way up to supervisor and serving as the Outsource Manager after graduating with his Bachelor's degree from the University of Florida. Matt with one of his childhood heroes, Franco Harris, former Pittsburgh Steelers running back. This was Matt's 10th marathon, which he ran in memory of Sue Konetzni who passed from a rare form of leukemia.